Colour: Deep golden colour. Nose: Toffee, smoky, orangey. Palate: Butterscotch notes with the subtlety of an aged cognac. Once the cooking cycle is complete, the softened agave fibre has to be pressed to separate the agave juices from the agave fibre. 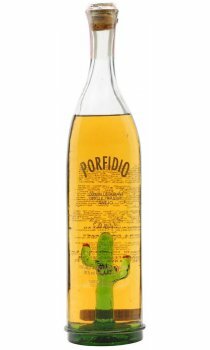 Press: As with ultra-premium olive oil, only the first pressing of the agave fibre is used for the production of Porfidio spirits. The agave juice is fermented by introducing micro-organisms, or 'good' bacteria, which convert the sugar into alcohol. 'Bad' bacteria would turn the agave juices into vinegar. The fermented agave juice has an alcoholic content of only 12% abv. Destileria Porfidio is the only factory in Mexico which implements quality fermentation in a rigorously controlled and therefore ideal environment.